I enjoyed reading the Meg and Mog stories as a child and had several in the book box in my first classroom. We recently inherited some of the books and now my daughter is enjoying them, she loves Meg’s spells as they never work quite as they should! The Story: Meg casts a spell to make eggs for supper. The spell doesn’t go as planned, the eggs are too big and hard to eat. In the middle of the night three dinosaurs hatch. Meg’s spell to save them from being eaten by the Tyrannosaurus causes all three dinosaurs to shrink. My daughter laughs when Meg’s spells go wrong, first the eggs are too big then the dinosaurs shrink to mouse size. Meg’s hair and Mog’s whiskers stand on end when three huge eggs fly out of the cauldron with lovely Plink, Plonk, Plunk sounds. Stegosaurus and Diplodocus have cute, friendly expressions but Tyrannosaurus is fierce with a mouthful of sharp teeth. Luckily Meg’s spell to save them works fairly well but the dinosaurs are so small that she needs a magnifying glass to see them! 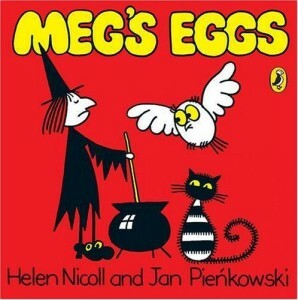 Meg’s Eggs has a very simple, easy to read text which is great for beginner readers. I like the way that speech bubbles move the story along and enhance the simple sentences. The rhyming spells add to the humour and I love the use of onomatopoeia. The illustrations on the double spreads are colourful, bold and humorous and will appeal to toddlers who will enjoy the board book version. My daughter likes copying the simple pictures, she especially likes drawing Owl. Reading Meg’s Eggs has led to discussions about eggs hatching and discovering which animals and birds come out of eggs. It also stimulated a discussion about dinosaurs, what they eat, what their teeth look like and the difference between herbivores and carnivores. Meg’s Eggs is a fun story that will appeal to toddlers and preschoolers but is also a great book for preschoolers and developing readers. We also like the very first Meg and Mog story. We are introduced to Meg, Mog and Owl as well as Meg’s friends. Unfortunately Meg’s spell goes wrong and she manages to turn her friends into mice! Do you have a favourite Meg and Mog story that you would recommend? Meg’s Eggs sounds like a fun story. I like that it’s good for beginning readers, but can also be used as a read aloud. Thanks for sharing this on the hop. 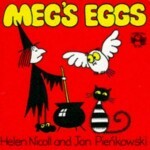 Meg’s Eggs and Meg and Mog are fun stories to read. I remember enjoying Meg’s Veg as a child too.